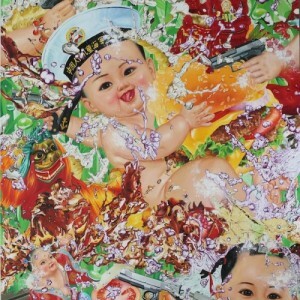 The Luo brothers consists of Luo Wei Dong (1963), Luo Wei Bing (1964) and Luo Wei Guo (1972) are born in Nanning, southern province of Guangxi, China. 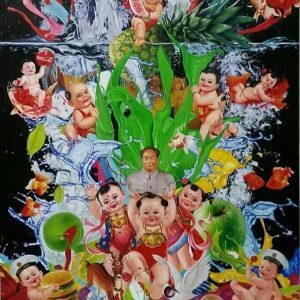 They graduated from the Guangxi Academy of Art, the Guangzhou Academy of Fine Art and the Central Academy of Applied Arts respectively. 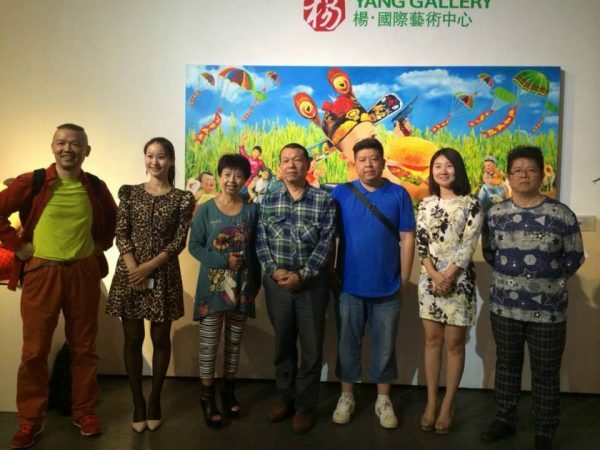 YANG GALLERY Team with the Luo Brothers at their ‘Welcome Welcome Solo Exhibition’ held in YANG GALLERY • Beijing 798. 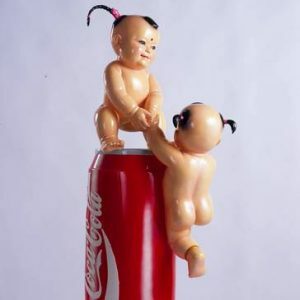 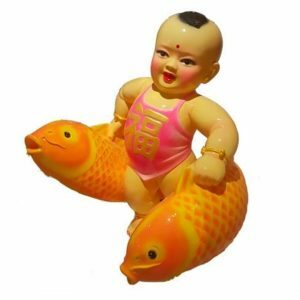 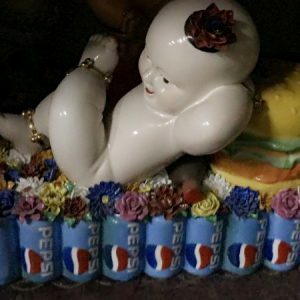 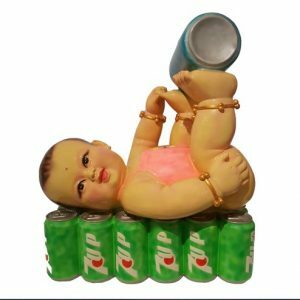 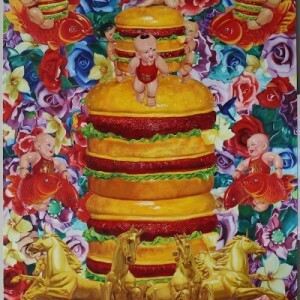 Famous for creating iconic works from the oriental side of nature, the Luo Brothers’ works are in effect a conglomeration of what makes up the modern Chinese society today.In their series ‘Welcome Welcome’, a Luo Brothers bouncing baby has held aloft most of the world’s foreign consumer products. 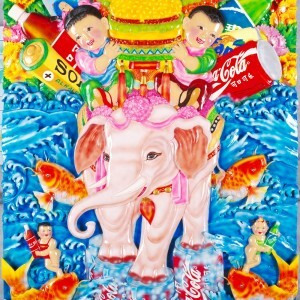 When one thinks about it, the same mix can be found in other cultures around the world. 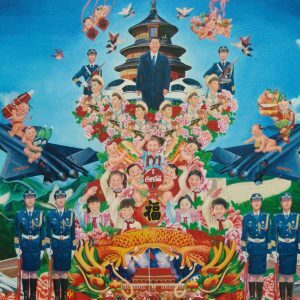 However, what’s so different and unique about the Chinese experience is the way it had happened so quickly. 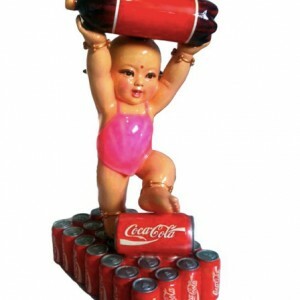 In the span of thirty years since the death of Chairman Mao, China had gone from a uniformly colorless society to one that makes our eyes and ears ache with the daily assaults of colors, lights and noise…. 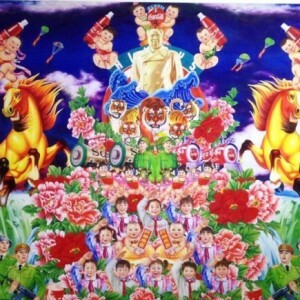 The Luo Brothers’ works are a successful reflection to this explosion of vitality. 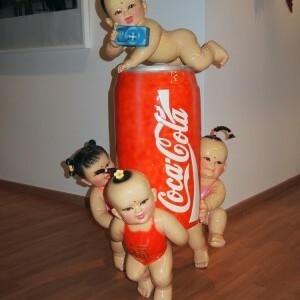 The cynic says this is a corruption of tradition, the corruption of things made serious by vile consumerism. 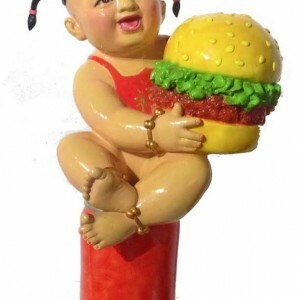 They may have a point, there is certainly a lack of spirituality in the sugar and fat enriched cupcake-lands of the Luo Brothers’ bouncy babies, but we must not forget that to many this is infinitely preferable compared to the drab and uni-colored ‘Red (era)’. 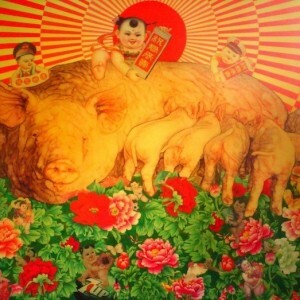 These works are fun, their visions very much embrace the ‘new’ China and they revel in it. 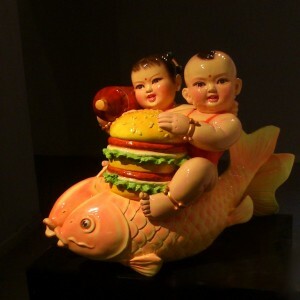 Through the Luo Brothers’ works, we are shown the exuberant and merry mature of choice in its truest form.